Keep in mind food and water will be the hardest things to find during and after a disaster. Even if you have cash on hand to buy food, your ability to obtain additional food could be limited. Think about the recent disasters in Haiti, New Zealand, Japan and Hurricane Sandy - it didn't take long for the stores shelves to become empty leaving many people going days and even weeks without food. As humans we can only survive 3-5 days without water but we can survive 2-4 weeks without food if necessary. But if you start preparing now won't need to worry about counting the days. Begin with storing a 3-5 day supply of disaster foods such as canned, dried, freeze dried & MREs food items. Select foods that are compact and lightweight, require no refrigeration, minimal preparation or cooking and little or no water. Consider purchasing cookbooks that have recipes for outdoor cooking, such as camping cookbooks. Its important to check items for shelf life, store them properly and to rotate items every three months. Store items in a dry place where temperatures remain fairly constant. The ideal temp is 70 degrees Fahrenheit. Beware of reusing containers unless it has been used for the same product that you will be that filling it with. It is best to purchase new containers and even better if you can get food-grade containers. Get containers that stack if at all possible. Round is better than square for air circulation purposes. Avoid transparent containers as this lets in light, which will degrade the food more quickly. Label your containers on the top and sides with the name of item and the date it was stored for easy identification and rotation. Place a small amount of dried ice in the top of the container to remove oxygen or 6-8 large dried bay leaves throughout to ward off bugs. 1 - Eat up all perishable food and items from the refrigerator. Keep the refrigerator door closed as much as possible. 2 - After all perishable food is gone start using the foods in your freezer. 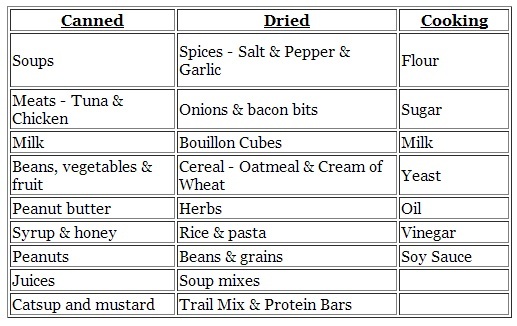 If you have kept the door closed these foods should last for several days before spoiling. 3 - Then begin using your emergency food supply. The best thing about keeping canned foods as a part of your emergency food storage is they can be heated up right in the can. First remove the paper label, then open the can and place it on your heating source for several minutes. If you prefer to purchase your emergency food kit already prepared, there are a number of great options available. Freeze dried foods have come a LONG WAY since I was a child. My spouse just taste-tested a Mountain House beef stew and said it would be perfect for our next camping trip. I would have tried it, but I am gluten-intolerant. I have to be careful about the emergency foods I select. These foods are great for people who can eat them. 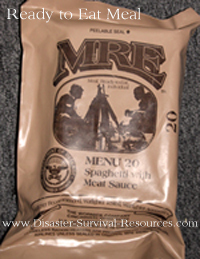 Here picture of an MRE (meal ready to eat) which feeds one person. These are traditionally meals used for members of the military, but they can be purchased by anyone. You will not need power to cook a meal like this. These meals are wholesome and nutritious, which will be very important when you need to keep your health level up and your stress level down. Or, if you have a green thumb, you should seriously consider growing your own Emergency Food Supply. This takes planning, of course, but it is a viable option for many people. Learn about Heirloom Seeds and how growing your own fruits and vegetables can provide the right kind of nutrition for you and your entire family - and at a lower cost than buying food at the grocery store or ready made meals. Next, think about growing mushrooms in your own back yard. It doesn't have to take up a lot of space and you can grow a number of varieties. They are low in calories, fat-free, gluten-free and cholesterol-free as well as having vitamins and minerals not found in many other sources of food. Give them a try. Another option is to learn How to Dry Food either using a dehydrator or using other methods, such as your oven or even the sun. 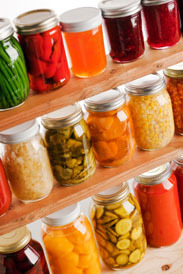 It is a great way to store fruits and vegetables (and even meats) for long term food storage or keep from wasting foods by drying them before they go bad. Awesome, right? Regardless of which path you choose, BE PREPARED!